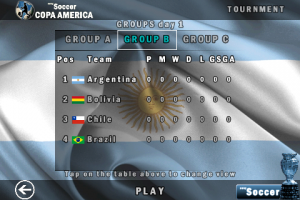 easySoccer, acclaimed 2d soccer game for Android and iPhone/iPad, now meets Copa America! This version has a completly new interface and, while it does not offer bluetooth player vs player or OpenFeint support, it has improvements in the gameplay and (on Android OS) it’s able to run even on Galaxy mini devices. In a time of hyper-realistic 3d soccer matches, here we are with a 2d, arcade, sweet taste of the past, able to join the obvious desire for a game able to offer a very good challenge, with the from-the-top view typical of the very first softwares of this kind. easySoccer will let you experience an easy to play / hard to master kind of entertainment, with three different game controls (virtual pad, accelerometer and – available on iPad only – touch’n’go), three difficulty levels (easy, normal, hard) and two game modes (arcade, and semi-arcade), for full feature matches that will keep you tied to your device, no matters what! And be aware that “easy” doesn’t mean that victory is always in reach. The proprietary arcade IA that moves your team members and the opponents will provide you with fun but paced actions, requiring your attention and gaming strenght, in order to win.